Sander Kleinenberg recently has recently been touring across South America and Europe as well as landing a spot on the bill of famed US Festival, Coachella. In the midst of his worldwide tour, the Dutchman recently announced the release of his disco infused track ‘We-R-Superstars’. Since it was premiered as an ID track on Billboard last month several blogs and websites identified it as the instrumental to the upcoming collaboration between Madonna and Daft Punk. With rumours spreading like wildfire just hours after its premiere and after being teased twice on Pete Tong’s BBC Radio 1 show, the track is a different vein to Sander’s usual electro house tracks. It embodies a high-energy smooth disco melody that strikes a balance with the punchy bassline. 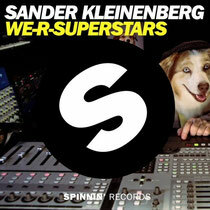 An array of cheerful analog chords, filtered funk synths and robotic vocal elements give ‘We-R-Superstars’ decent energy throughout. The track’s already raced up over 200,000 views on YouTube over the weekend. With more music slated for release over the coming months, fans of the Little Mountain Recordings honcho will be pleased to hear he is all set to air a brand new podcast as well as making an imminent guest appearance on Spinnin’ sessions. Check Sander’s tour dates below, and look out for ‘We-R-Superstars’ on 11 July.